Gas Turbine Market size was valued over USD 8 billion in 2017 with annual installations to surpass 34 GW by 2024. The global gas turbine market in the current industrial regime has significantly been influenced pertaining to rising energy demand from manufacturing plants and associated industrial establishments. Demand and supply balance has been a perpetual concern for utilities and private entities which has further led to extensive flow of funds toward the expansion of sustainable power generation plants. As per EIA in 2015, natural gas fueled over 25% of the overall electricity generation across the U.S. and is further projected to exceed 30% by 2025. Rising investment towards the replacement of conventional electricity generating technologies with advance gas-fired generating stations to curb emissions will nurture the global gas turbine market growth. Government of China in 2016 has also introduced a new action plan to rein emission levels to 18% by 2020. In addition, the advent of shale gas technology has led to an escalation in E&P activities across remote offshore & onshore basins which in turn will positively sway the overall industry dynamics. < 50 kW gas turbine market is set to surpass an annual installation of over 1 GW by 2024. Ongoing expansion of co-generating units to sustain energy & heat consumption across small commercial, industrial and isolated grid networks will enhance the technological adoption. In addition, ongoing advancements with respect to the development of effective re-generative gas turbines to sustain low heat requirements across these establishments will further foster the product demand. Ongoing adoption of distributed generation technologies across stationary energy generation applications will drive the > 500 KW to 1 MW gas turbine market growth. Lesser number of moving parts, light weight, compact size, improved efficiency, lower electricity costs, lower emissions, and potential to utilize waste fuels are few indispensable parameters driving the adoption of these products. In addition, ongoing technological enhancement with respect to the efficiency and flexibility improvements across both un-recuperated and recuperated systems will further complement the industry outlook. Aero-derivative gas turbine market subject to the availability of highly flexible & mobile technologies to serve across a wide tandem of applications is set to witness growth of over 2% by 2024. Marine propulsion, utility generation, district heating, mobile power, grid stability, and mobile power are certain primary applications driving the demand for these units. Furthermore, light weight, environmental proximity, higher rotation speed, operational versatility, and low water consumption are few imperative parameters influencing the product demand. Heavy duty gas turbine market owing to their high capacity operations along with economical cost structure have gained significant penetration in the current industrial regime. Rapid technological enhancements along with increasing demand for these turbines across utility aided large power generating and heat recovery plants has instituted a favorable business scenario. Although, distributed generation technologies along with small scale electric networks including micro-grids support the adoption of low capacity gas turbines. However, favorable industry inclination to augment utility aided establishments coupled with the ongoing product enhancements will sustain the technological demand. Comparatively lower warm up time, light weight, compact size, operational versatility, quick start and less dependency on cooling water are few indispensable parameters driving the open cycle gas turbine market. In reference to land-based industries, these units find wide applicability across direct and mechanical drive applications. Furthermore, power generation applications extended to offshore platforms along with deployment across aircrafts where minimizing weight is a major focus pose potential demand for these units. Straining of available energy resources including hydro power and coal in conjunction with government focus towards energy matrix optimization will stimulate the combined cycle gas turbine market growth. Furthermore, paradigm shift from coal fired generating units coupled with widening demand and supply gap has made combined cycle plants an attractive investment prospect. Growing demand for energy coupled with positive regulatory and consumer outlook towards the integration of sustainable energy infrastructure will foster the power generation gas turbine market. Energy conservation mandates coupled with effective utilization of generated energy have further strengthened the product adoption. 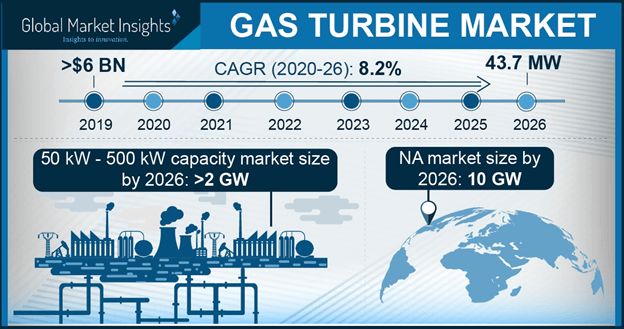 In addition, rising investments toward the expansion and integration of combined heat and power plants coupled with the flourishing distributed generation technology will further complement the business outlook of gas turbine market. Gas turbines are largely used to power aircraft engines along with maintaining an effective power to weight ratio to sustain a flight. The aviation industry in the recent years has gained significant proliferation with large number of migrants and tourists excavating across the globe. Furthermore, aircrafts used for military applications have gained strong demand subject to the adherence to national security. Increasing fleet count coupled with rapid technological enhancements to cater a large consumer base through maintaining the reliability and efficiency will augment the overall gas turbine market size. China gas turbine market owing to the development of large scale gas fired power generating stations is set to exceed USD 600 Million by 2024. Siemens in 2017 fetched a gas turbine order from CAPCO to power a 550 MW combined cycle generating unit. The company with its SGT5-8000H gas turbine aims to execute its first Chinese power plant component order in past 20 years. Furthermore, the deal has also been aligned with the company’s prospect of global expansion along with the integration of a versatile distribution channel. UAE gas turbine market is anticipated to witness growth subject to an increase in O&G activities across both offshore & onshore regional platforms. Abu Dhabi Marine Operating Company in 2016 procured Siemens manufactured industrial Trent 60 generator package for its offshore oil field across Zirku Island. 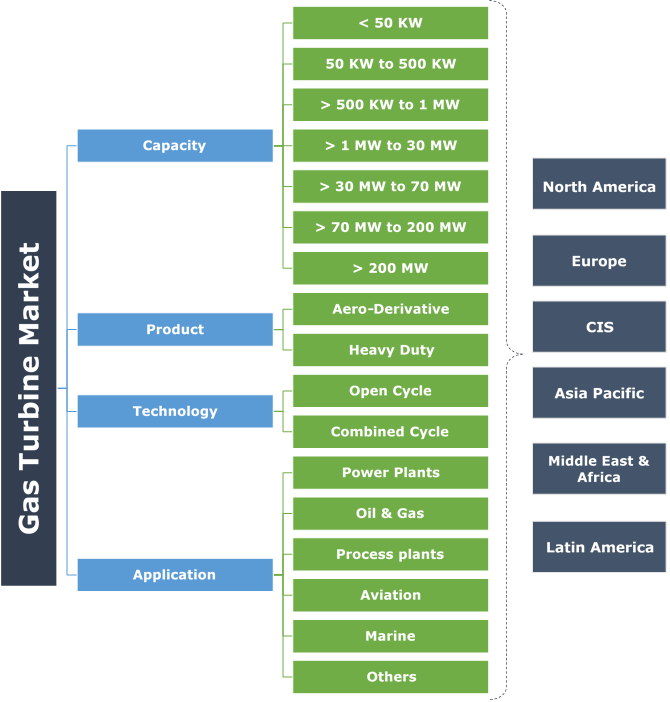 Eminent industry players across the gas turbine market include General Electric, Siemens AG, Wartsila, Mitsubishi Hitachi Power Systems, BHEL, Kawasaki Heavy Industries, Ansaldo Energia, Solar Turbines, Vericor Power Systems, Opra Turbines, Man Diesel & Turbo, Capstone Turbine, Cryostar, NPO Saturn, Harbin Electric International Company, and Zorya-Mashproekt. Leading industry participants have aligned their focus towards significant research and innovation investments to strengthen their business platform. The companies have made considerable strides in enhancing their portfolio and industrial performance through building and expanding their business infrastructure foundations. Large scale investments in adjacencies and pursuing core competitive opportunities have been a pivotal for the company strategies. A gas turbine is also known as a combustion turbine, or a continuous internal combustion engine. The product operates on the Brayton cycle with air being the working fluid. In a gas turbine, gases undergo 4 thermodynamic processes including isentropic compression, isobaric combustion, isentropic expansion & heat rejection.